On March 19-21, 2018, the 3rd International Folklore Festival "Terekeme Chershenbesi" was held in the village of Gegeli, Agsu region. 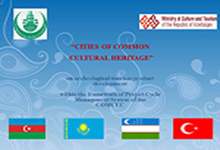 The organizers of the Festival were the Social Organization in Support of Studying of Cultural Heritage of MIRAS and the Nomadic Tarakama Folklore Research and Promotion Group under the Secondary school named after Hagigat Musayev of Gagali village. MIRAS - Social Organization in Support of Studying of Cultural Heritage accomplished the carried out training tour as a part of "Erasmus+" program in partnership with Union of Turkish Associations in Belgium. Starting project with the training tour to Azerbaijan in 2015 finished with the travel to Belgium between 28 October and 3 November in 2016. 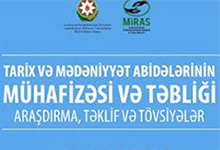 Since 2014 the holiday of the archaeologists has been marking in Azerbaijan in initiative of MIRAS Social Organization in Support of Studying of Cultural Heritage. Every year archaeology festival is held in the Medieval Agsu Town with participation of archaeologists, ethnographs, epigraphs, art historians, as well as volunteers of cultural heritage from Baku, Agsu, Shamakhi, Ismayilli and also local residents. On 20-26 June, 2016 MIRAS Social Organization in Support of Studying of Cultural Heritage completed research stage of project “The Role of Women in Rural Lifestyle Development” in Gagali, Bijo and Gashad villages of Agsu region. On 23 June, 2016 there was held photo-exhibition and friendly meeting of Azerbaijani and Russian youth in Russian Culture and Information Centre of embassy of Russia in Azerbaijan dedicated to 27 June Day of Russian youth. Azerbaijani and Russian out take part at the event co-arranged by MIRAS Social Organization.